The 2018 season was the New Orleans Saints' 52nd in the National Football League, their 43rd at the Mercedes-Benz Superdome and their 12th under head coach Sean Payton. This season was the first since 1984 without owner Tom Benson, who died in March. On week 11, the Saints beat the Eagles to reach their first 9 game winning streak since their Super Bowl winning season in 2009, ensuring they clinched their second consecutive winning season for the first time since 2010/2011. They swept their division rivals, the Atlanta Falcons, after a 31–17 victory on Thanksgiving night for the first time since 2015 while extending their second longest winning streak in franchise history to 10 games, which came to an end when the Saints lost to the Dallas Cowboys 13–10, on November 29th. On December 9th, the Saints clinched their second straight NFC South division championship when they defeated the Tampa Bay Buccaneers, their first back-to-back titles in franchise history. On December 17th, after beating their division rivals Carolina Panthers on Monday Night, the Saints improved on their 11–5 record from a season ago. After a Week 16 win over the Pittsburgh Steelers, the Saints clinched homefield advantage throughout the playoffs for the first time since 2009. The Saints finished the Season with a 13–3 record for the third time in franchise history, matching their franchise win record with their 2009 and 2011 teams. In the playoffs, the Saints defeated the defending Super Bowl champion Philadelphia Eagles 20–14 in the Divisional Round. However, the Saints' season came to an end in an overtime loss 23–26 at home to the Los Angeles Rams in the NFC Championship Game in controversial fashion, which ended their hopes of returning to the Super Bowl for the first time since Super Bowl XLIV and was their first time since 2006 losing in the NFC Championship Game, which was also the first year of the Brees/Payton era. Additionally, it marked the first time since 1992 that the Saints lost a postseason game at home. The Saints traded their 2018 first-round selection (27th overall), along with their 2019 first-round selection to the Green Bay Packers in exchange for the 14th overall selection. The Saints received a 2018 sixth-round selection (189th overall) from the Arizona Cardinals in exchange for running back Adrian Peterson. The Saints' 2018 schedule was released on April 19. NO – Alvin Kamara 5-yard run (Lutz kick) Saints 7-0 Drive 6 plays, 71 yards, 3:19. TB – DeSean Jackson 58-yard pass from Ryan Fitzpatrick (Catanzaro kick) Tied 7–7 Drive 4 plays, 58 yards, 2:00. NO – Will Lutz 36-yard field goal Saints 10-7 Drive 11 plays, 58 yards, 5:16. TB – Ryan Fitzpatrick 3-yard run (Catanzaro kick) Buccaneers 14-10 Drive 6 plays, 75 yards, 2:27. NO – Ted Ginn 28-yard pass from Drew Brees (Lutz kick) Saints 17-14 Drive 4 plays, 74 yards, 2:04. TB – Chandler Catanzaro 33-yard field goal Tied 17-17 Drive 8 plays, 60 yards, 3:42. TB – Chris Godwin 9-yard pass from Ryan Fitzpatrick (Catanzaro kick) Buccaneers 24-17 Drive 10 plays, 78 yards, 5:00. NO – Michael Thomas 6-yard pass from Drew Brees (Lutz kick) Buccaneers 31-24 Drive 9 plays, 75 yards, 3:32. TB – Chandler Catanzaro 36-yard field goal Buccaneers 34-24 Drive 9 plays, 57 yards, 3:36. TB – Mike Evans 50-yard pass from Ryan Fitzpatrick (Catanzaro kick) Buccaneers 41-24 Drive 4 plays, 74 yards, 2:10. TB – DeSean Jackson 36-yard pass from Ryan Fitzpatrick (Catanzaro kick) Buccaneers 48-24 Drive 6 plays, 65 yards, 3:07. NO – Alvin Kamara 1-yard run (Kamara run) Buccaneers 48-32 Drive 10 plays, 75 yards, 3:25. NO – Alvin Kamara 7-yard pass from Drew Brees (Ginn pass from Brees) Buccaneers 48-40 Drive 5 plays, 66 yards, 1:21. NO – Will Lutz 31-yard field goal, 2:47. Tied 3–3. Drive: 11 plays, 63 yards, 5:42. CLE – Zane Gonzalez 39-yard field goal, 1:55. Browns 6–3. Drive: 7 plays, 45 yards, 2:21. CLE – Carlos Hyde 1-yard run (PAT no good), 6:43. Browns 12–3. Drive: 12 plays, 79 yards, 6:27. NO – Michael Thomas 2-yard pass from Drew Brees (Will Lutz kick), 8:41. Browns 12–10. Drive: 9 plays, 66 yards, 5:35. NO – Michael Thomas 5-yard pass from Drew Brees (Alvin Kamara run for two-point conversion), 2:40. Saints 18–12. Drive: 4 plays, 18 yards, 2:17. CLE – Antonio Callaway 47-yard pass from Tyrod Taylor (PAT no good), 1:16. Tied 18–18. Drive: 6 plays, 75 yards, 1:24. NO – Will Lutz 44-yard field goal, 0:21. Saints 21–18. Drive: 6 plays, 49 yards, 0:55. NO – Ted Ginn Jr. 4-yard pass from Drew Brees (Wil Lutz kick), 11:45. Saints 7–0. Drive: 6 plays, 75 yards, 3:15. ATL – Calvin Ridley 18-yard pass from Matt Ryan (Matt Bryant kick), 2:45. Tied 7–7. Drive: 12 plays, 81 yards, 6:06. NO – Wil Lutz 49-yard field goal, 9:37. Saints 10–7. Drive: 6 plays, 31 yards, 2:21. NO – Wil Lutz 21-yard field goal, 3:06. Saints 13–7. Drive: 8 plays, 70 yards, 4:46. ATL – Calvin Ridley 75-yard pass from Matt Ryan (Matt Bryant kick), 2:12. Falcons 14–13. Drive: 2 plays, 75 yards, 0:54. NO – Wil Lutz 45-yard field goal, 0:06. Saints 16–14. Drive: 3 plays, 31 yards, 0:34. ATL – Calvin Ridley 9-yard pass from Matt Ryan (Matt Bryant kick), 12:00. Falcons 21–16. Drive: 6 plays, 75 yards, 3:00. NO – Cameron Meredith 11-yard pass from Drew Brees (Wil Lutz kick), 6:07. Saints 23–21. Drive: 4 plays, 16 yards, 2:29. ATL – Tevin Coleman 5-yard pass from Matt Ryan (Matt Ryan-Austin Hooper pass), 14:11. Falcons 29–23. Drive: 12 plays, 82 yards, 6:56. NO – Zach Line 1-yard pass from Drew Brees (Wil Lutz kick), 9:59. Saints 30–29. Drive: 8 plays, 75 yards, 4:12. ATL – Mohamed Sanu 5-yard pass from Matt Ryan (Matt Ryan-Mohamed Sanu pass), 6:56. Falcons 37–30. Drive: 5 plays, 75 yards, 3:01. NO – Drew Brees 7-yard run (Wil Lutz kick), 1:15. Tied 37–37. Drive: 11 plays, 81 yards, 5:43. NO – Drew Brees 1-yard run, 2:55. Saints 43–37. Drive: 15 plays, 80 yards, 7:05. NYG – Sterling Shepard 2-yard TD pass from Eli Manning. (Aldrick Rosas kick), 8:42. Giants 7–0. Drive: 10 plays, 75 yards, 4:59. NO – Will Lutz – 42 yard field goal, 14:55. Giants 7–3. Drive: 15 plays, 51 yards, 8:29. NO – Will Lutz – 34 yard field goal, 7:18. Giants 7–6 Drive: 9 plays, 69 yards, 3:31. NO – Will Lutz – 37 yard field goal, 3:36. Saints 9–7 Drive: 4 plays, -8 yards, 0:57. NO – Will Lutz – 26 yard field goal, 0:11. Saints 12–7 Drive: 7 plays, 40 yards, 2:21. NO – Alvin Kamara – 9 yard TD run. (Will Lutz kick), 7:16. Saints 19–7. Drive: 7 plays, 80 yards, 3:17. NYG – Aldrick Rosas – 33 yard field goal, 2:02. Saints 19–10. Drive: 10 plays, 75 yards, 5:14. NO – Alvin Kamara – 4 yard TD run. (Will Lutz kick), 6:47. Saints 26–10. Drive: 14 plays, 74 yards, 6:39. NYG – Saquon Barkley – 1 yard TD run. (Eli Manning pass to Sterling Shepard for two-point conversion), 3:44. Saints 26–18. Drive: 10 plays, 75 yards, 3:03. NO – Alvin Kamara – 49 yard TD run. (Will Lutz kick), 2:06. Saints 33–18. Drive: 6 plays, 97 yards, 1:38. NO – Mark Ingram Jr. 2-yard run (kick failed), 10:41. Saints 6–0. Drive: 6 plays, 64 yards, 3:13. WAS – Dustin Hopkins 37-yard field goal, 2:37. Saints 6–3. Drive: 15 plays, 56 yards, 8:04. NO – Josh Hill 1-yard pass from Drew Brees (Wil Lutz kick), 10:38. Saints 13–3. Drive: 13 plays, 75 yards, 6:59. WAS – Dustin Hopkins 53-yard field goal, 8:36. Saints 13–6. Drive: 6 plays, 40 yards, 2:02. NO – Mark Ingram Jr. 1-yard run (Wil Lutz kick), 3:43. Saints 20–6. Drive: 10 plays, 75 yards, 4:53. NO – Tre'Quan Smith 62-yard pass from Drew Brees (run failed), 2:36. Saints 26–6. Drive: 1 plays, 62 yards, 0:10. WAS – Alex Smith 4-yard run (Dustin Hopkins kick), 0:26. Saints 26–13. Drive: 3 plays, 16 yards, 0:56. NO – Tre'Quan Smith 35-yard pass from Drew Brees (Wil Lutz kick), 12:23. Saints 33–13. Drive: 5 plays, 74 yards, 2:37. NO – Taysom Hill 1-yard run (Wil Lutz kick), 6:43. Saints 40–13. Drive: 2 plays, 4 yards, 1:00. NO – Wil Lutz 44-yard field goal, 14:10. Saints 43–13. Drive: 6 plays, 22 yards, 3:09. WAS – Kapri Bibbs 1-yard run (pass failed), 10:25. Saints 43–19. Drive: 7 plays, 75 yards, 3:42. This game was one year removed from last season, where the Saints overcame a 15-point deficit against the Redskins at home with three minutes remaining. This time, the Saints dominated the entire game. This game marked Drew Brees passing Brett Favre and Peyton Manning on most passing yards. The win improved the Saints to 4-1. BAL – Justin Tucker 31-yard field goal, 6:04. Ravens 3–0. Drive: 17 plays, 63 yards, 7:23. NO – Benjamin Watson 1-yard pass from Drew Brees (Wil Lutz kick), 1:53. Saints 7–3. Drive: 8 plays, 75 yards, 4:11. BAL – Lamar Jackson 1-yard run (Justin Tucker kick), 0:04. Ravens 10–7. Drive: 6 plays, 75 yards, 1:49. BAL – Mark Andrews 8-yard pass from Joe Flacco (Justin Tucker kick), 3:30. Ravens 17–7. Drive: 10 plays, 61 yards, 4:02. NO – Alvin Kamara 2-yard run (Wil Lutz kick), 12:32. Ravens 17–14. Drive: 12 plays, 75 yards, 5:58. NO – Michael Thomas 5-yard pass from Drew Brees (Wil Lutz kick), 4:58. Saints 21–17. Drive: 12 plays, 56 yards, 6:18. NO – Wil Lutz 39-yard field goal, 2:07. Saints 24–17. Drive: 7 plays, 43 yards, 1:12. BAL – John Brown 14-yard pass from Joe Flacco (kick failed), 0:24. Saints 24–23. Drive: 6 plays, 81 yards, 1:43. Drew Brees would throw his 500th touchdown pass against Baltimore, and becoming the third quarterback in modern NFL history to defeat all 32 teams playing in the 2018 season — after Peyton Manning and Brett Favre. In doing so, he improved his record against the Ravens to 1-4. NO – Alvin Kamara 3-yard pass from Drew Brees (Wil Lutz kick), 10:33. Saints 7–0. Drive: 8 plays, 81 yards, 4:27. MIN – Stefon Diggs 1-yard pass from Kirk Cousins (Dan Bailey kick), 3:16. Tied 7–7. Drive: 13 plays, 91 yards, 7:17. MIN – Latavius Murray 1-yard run (kick failed, wide left), 11:57. Vikings 13–7. Drive: 7 plays, 80 yards, 4:05. NO – Wil Lutz 52-yard field goal, 7:27. Vikings 13–10. Drive: 8 plays, 33 yards, 4:30. NO – Alvin Kamara 1-yard run (Wil Lutz kick), 0:30. Saints 17–13. Drive: 2 plays, 18 yards, 0:27. NO – Wil Lutz 42-yard field goal, 8:19. Saints 20–13. Drive: 9 plays, 21 yards, 4:09. NO – P. J. Williams 45-yard interception return (Wil Lutz kick), 5:58. Saints 27–13. NO – Wil Lutz 42-yard field goal, 9:35. Saints 30–13. Drive: 15 plays, 60 yards, 8:15. MIN – Adam Thielen 1-yard pass from Kirk Cousins (Dan Bailey kick), 4:26. Saints 30–20. Drive: 13 plays, 75 yards, 5:09. The Saints travelled to Minnesota for the first time since the 2017 Divisional round; during which safety Marcus Williams missed a tackle on the game's final play that allowed a 61-yard game-winning touchdown reception by Stefon Diggs. In this divisional round rematch, despite a good offensive showing from Kirk Cousins and Stefon Diggs, and Drew Brees who was held to just 120 passing yards, New Orleans still won the game 30-20 to go to 6-1 and avenge their aforementioned playoff loss. NO – Alvin Kamara 11-yard run (Wil Lutz kick), 9:25. Saints 7–0. Drive: 10 plays, 75 yards, 5:35. LAR – Todd Gurley 8-yard run (Greg Zuerlein kick), 6:04. Tied 7–7. Drive: 6 plays, 71 yards, 3:21. NO – Alvin Kamara 16-yard pass from Drew Brees (Wil Lutz kick), 1:40. Saints 14–7. Drive: 8 plays, 75 yards, 4:24. LAR – Brandin Cooks 4-yard pass from Jared Goff (Greg Zuerlein kick), 14:12. Tied 14–14. Drive: 6 plays, 75 yards, 2:28. NO – Tre'Quan Smith 4-yard pass from Drew Brees (Wil Lutz kick), 7:35. Saints 21–14. Drive: 10 plays, 87 yards, 5:31. NO – Benjamin Watson 13-yard pass from Drew Brees (Wil Lutz kick), 1:06. Saints 28–14. Drive: 6 plays, 59 yards, 2:24. NO – Alvin Kamara 1-yard run (Wil Lutz kick), 0:26. Saints 35–14. Drive: 6 plays, 34 yards, 0:33. LAR – Greg Zuerlein 56-yard field goal, 0:00. Saints 35–17. Drive: 5 plays, 37 yards, 0:26. LAR – Malcolm Brown 18-yard pass from Jared Goff (Greg Zuerlein kick), 9:38. Saints 35–24. Drive: 11 plays, 77 yards, 5:22. LAR – Greg Zuerlein 34-yard field goal, 1:30. Saints 35–27. Drive: 9 plays, 68 yards, 3:56. LAR – Cooper Kupp 41-yard pass from Jared Goff (Jared Goff-Gerald Everett pass), 9:48. Tied 35–35. Drive: 6 plays, 83 yards, 3:39. NO – Wil Lutz 54-yard field goal, 6:23. Saints 38–35. Drive: 9 plays, 40 yards, 3:23. NO – Michael Thomas 72-yard pass from Drew Brees (Wil Lutz kick), 3:52. Saints 45–35. Drive: 3 plays, 75 yards, 0:58. With the victory, the Saints extended their winning streak to 7 games (Starting from week 2) and ended the previously 8-0 Rams' chances at completing a perfect season. Also, star wide receiver Michael Thomas, after scoring on his 12th reception, paid homage to former Saints wide receiver Joe Horn by pulling out a cell phone from underneath the goalpost pretending to make a call. This celebration drew a 15-yard unsportsmanlike conduct penalty. NO – Michael Thomas 7-yard pass from Drew Brees (Wil Lutz kick), 6:30. Saints 7–0. Drive: 15 plays, 75 yards, 8:30. CIN – John Ross 2-yard pass from Andy Dalton (Randy Bullock kick), 1:56. Tied 7–7. Drive: 8 plays, 75 yards, 4:34. NO – Mark Ingram Jr. 28-yard pass from Drew Brees (Wil Lutz kick), 13:33. Saints 14–7. Drive: 6 plays, 75 yards, 3:23. NO – Alvin Kamara 4-yard run (Wil Lutz kick), 5:34. Saints 21–7. Drive: 9 plays, 90 yards, 4:54. NO – Alvin Kamara 1-yard run (Wil Lutz kick), 1:22. Saints 28–7. Drive: 9 plays, 60 yards, 2:40. NO – Michael Thomas 17-yard pass from Drew Brees (Wil Lutz kick), 0:02. Saints 35–7. Drive: 1 plays, 17 yards, 0:06. NO – Wil Lutz 29-yard field goal, 9:04. Saints 38–7. Drive: 8 plays, 61 yards, 4:08. NO – Drew Brees 1-yard run (Wil Lutz kick), 2:25. Saints 45–7. Drive: 8 plays, 62 yards, 3:56. NO – Wil Lutz 42-yard field goal, 10:41. Saints 48–7. Drive: 9 plays, 35 yards, 5:52. NO – Wil Lutz 41-yard field goal, 7:17. Saints 51–7. Drive: 4 plays, 4 yards, 1:35. CIN – Jeff Driskel 27-yard run (Randy Bullock kick), 4:42. Saints 51–14. Drive: 6 plays, 75 yards, 2:35. After losing the newly acquired Dez Bryant for the year with an Achilles' tear in practice, several players, including Michael Thomas, and running backs Mark Ingram and Alvin Kamara paid tribute by throwing up Bryant's signature 'X' celebration each time they scored. Safety Marcus Williams returned a long interception to end the first half with the Saints leading 35-7. New Orleans would eventually stun the Bengals in a 51-14 victory and their streak continued, going 8-1. NO – Wil Lutz 38-yard field goal, 9:10. Saints 3–0. Drive: 8 plays, 57 yards, 4:14. NO – Austin Carr 3-yard pass from Drew Brees (Wil Lutz kick), 3:12. Saints 10–0. Drive: 11 plays, 86 yards, 4:52. NO – Mark Ingram Jr. 14-yard rush (Wil Lutz kick), 12:07. Saints 17–0. Drive: 10 plays, 84 yards, 5:32. PHI – Josh Adams 28-yard rush (Jake Elliott kick), 8:42. Saints 17–7. Drive: 6 plays, 75 yards, 3:25. NO – Tre'Quan Smith 15-yard pass from Drew Brees (Wil Lutz kick), 0:39. Saints 24–7. Drive: 7 plays, 84 yards, 2:40. NO – Michael Thomas 23-yard pass from Drew Brees (Wil Lutz kick), 11:20. Saints 31–7. Drive: 6 plays, 70 yards, 3:40. NO – Mark Ingram Jr. 1-yard rush (Wil Lutz kick), 5:34. Saints 38–7. Drive: 7 plays, 41 yards, 4:22. NO – Alvin Kamara 37-yard pass from Drew Brees (Wil Lutz kick), 13:15. Saints 45–7. Drive: 7 plays, 87 yards, 3:18. NO – Wil Lutz 19-yard field goal, 6:46. Saints 48–7. Drive: 8 plays, 33 yards, 5:02. After head coach Sean Payton lost a golf bet to Eagles head coach Doug Pederson, the Saints, despite being the home team, wore their white color rush uniforms. 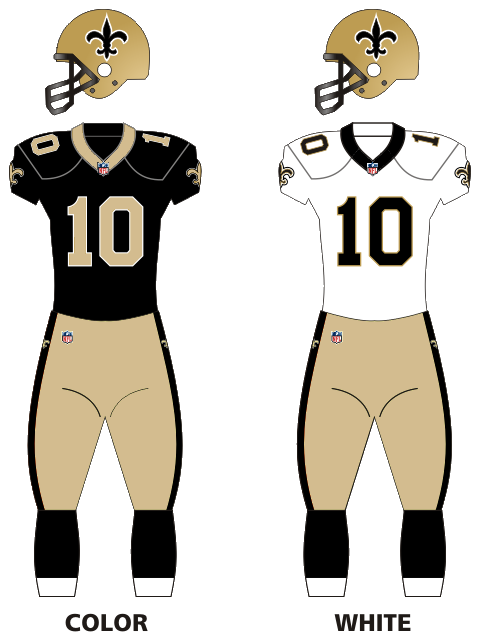 It was the first time the Saints used the uniforms at home. NO – Tommylee Lewis 28-yard pass from Drew Brees (Wil Lutz kick), 11:11. Saints 7–0. Drive: 7 plays, 75 yards, 3:49. ATL – Matt Bryant 32-yard field goal, 2:35. Saints 7–3. Drive: 8 plays, 25 yards, 3:03. NO – Wil Lutz 22-yard field goal, 9:09. Saints 10–3. Drive: 15 plays, 81 yards, 8:26. NO – Austin Carr 12-yard pass from Drew Brees (Wil Lutz kick), 3:20. Saints 17–3. Drive: 7 plays, 42 yards, 4:10. NO – Dan Arnold 25-yard pass from Drew Brees (Wil Lutz kick), 5:59. Saints 24–3. Drive: 6 plays, 70 yards, 3:18. ATL – Calvin Ridley 2-yard pass from Matt Ryan (Matt Bryant kick), 0:22. Saints 24–10. Drive: 13 plays, 79 yards, 5:37. NO – Keith Kirkwood 5-yard pass from Drew Brees (Wil Lutz kick), 9:27. Saints 31–10. Drive: 5 plays, 22 yards, 3:00. ATL – Tevin Coleman 4-yard pass from Matt Ryan (Matt Bryant kick), 1:51. Saints 31–17. Drive: 7 plays, 59 yards, 1:48. DAL – Brett Maher 26-yard field goal, 9:27. Cowboys 3–0. Drive: 12 plays, 67 yards, 5:36. DAL – Ezekiel Elliott 16-yard pass from Dak Prescott (Brett Maher kick), 0:57. Cowboys 10–0. Drive: 8 plays, 85 yards, 4:10. DAL – Brett Maher 46-yard field goal, 0:55. Cowboys 13–0. Drive: 16 plays, 70 yards, 9:09. NO – Wil Lutz 33-yard field goal, 10:03. Cowboys 13–3. Drive: 10 plays, 60 yards, 5:00. NO – Keith Kirkwood 30-yard pass from Drew Brees (Wil Lutz kick), 1:08. Cowboys 13–10. Drive: 10 plays, 88 yards, 4:39. TB – Cameron Brate 11-yard pass from Jameis Winston (Cairo Santos kick), 12:19. Buccaneers 7–0. Drive: 7 plays, 75 yards, 2:41. NO – Wil Lutz 30-yard field goal, 7:06. Buccaneers 7–3. Drive: 9 plays, 52 yards, 4:11. TB – Cameron Brate 1-yard pass from Jameis Winston (Cairo Santos kick), 0:26. Buccaneers 14–3. Drive: 6 plays, 39 yards, 1:56. NO – Zach Line 1-yard pass from Drew Brees (Alvin Kamara rush), 4:43. Buccaneers 14–11. Drive: 5 plays, 30 yards, 2:35. NO – Drew Brees 1-yard rush (Wil Lutz kick), 11:46. Saints 18–14. Drive: 10 plays, 51 yards, 5:35. NO – Mark Ingram Jr. 17-yard rush (Wil Lutz kick), 7:26. Saints 25–14. Drive: 7 plays, 53 yards, 3:08. NO – Wil Lutz 36-yard field goal, 1:12. Saints 28–14. Drive: 11 plays, 41 yards, 4:20. The New Orleans Saints trailed the Tampa Bay Buccaneers 14-3 halfway through the 3rd quarter when Taysom Hill sparked a rally by blocking a punt and setting up New Orleans inside Tampa Bay territory. The Saints would go on to win in a comeback 28-14 and clinching a playoff berth in the process. CAR – Chris Manhertz 50-yard pass from Christian McCaffrey (Chandler Catanzaro kick), 4:02. Panthers 7–0. Drive: 7 plays, 90 yards, 3:24. NO – Wil Lutz 46-yard field goal, 2:20. Panthers 7–3. Drive: 5 plays, 23 yards, 1:46. NO – Wil Lutz 24-yard field goal, 10:00. Panthers 7–6. Drive: 12 plays, 69 yards, 5:50. NO – Alvin Kamara 16-yard rush (pass failed), 12:12. Saints 12–7. Drive: 11 plays, 84 yards, 6:13. CAR – Donte Jackson New Orleans two-point conversion attempt interception return: 2 points Carolina. Saints 12–9. PIT – Chris Boswell 49-yard field goal, 5:32. Steelers 3–0. Drive: 9 plays, 29 yards, 4:46. NO – Mark Ingram Jr. 1-yard rush (Wil Lutz kick), 2:57. Saints 7–3. Drive: 6 plays, 75 yards, 2:35. PIT – Chris Boswell 30-yard field goal, 14:05. Saints 7–6. Drive: 9 plays, 78 yards, 3:52. NO – Alvin Kamara 8-yard rush (Wil Lutz kick), 10:22. Saints 14–6. Drive: 8 plays, 75 yards, 3:43. PIT – Jaylen Samuels 3-yard pass from Ben Roethlisberger (Ben Roethlisberger-Eli Rogers pass), 0:40. Tied 14–14. Drive: 15 plays, 97 yards, 6:04. NO – Wil Lutz 43-yard field goal, 0:02. Saints 17–14. Drive: 4 plays, 50 yards, 0:38. NO – Alvin Kamara 1-yard rush (Wil Lutz kick), 9:13. Saints 24–14. Drive: 11 plays, 75 yards, 5:47. PIT – Antonio Brown 3-yard pass from Ben Roethlisberger (Chris Boswell kick), 4:48. Saints 24–21. Drive: 9 plays, 75 yards, 4:25. PIT – Antonio Brown 20-yard pass from Ben Roethlisberger (Chris Boswell kick), 1:02. Steelers 28–24. Drive: 4 plays, 66 yards, 1:36. NO – Michael Thomas 2-yard pass from Drew Brees (Wil Lutz kick), 1:25. Saints 31–28. Drive: 10 plays, 46 yards, 2:41. CAR – Kyle Allen 1-yard rush (Chandler Catanzaro kick), 10:04. Panthers 7–0. Drive: 11 plays, 75 yards, 4:56. CAR – Cameron Artis-Payne 15-yard rush (kick failed), 2:07. Panthers 13–0. Drive: 9 plays, 89 yards, 4:51. CAR – Ian Thomas 8-yard pass from Kyle Allen (Chandler Catanzaro kick), 2:00. Panthers 20–0. Drive: 16 plays, 90 yards, 7:45. CAR – Chandler Catanzaro 22-yard field goal, 0:00. Panthers 23–0. Drive: 7 plays, 66 yards, 1:28. CAR – Curtis Samuel 53-yard pass from Kyle Allen (Chandler Catanzaro kick), 3:46. Panthers 30–0. Drive: 5 plays, 75 yards, 2:34. NO – Tre'Quan Smith 9-yard pass from Teddy Bridgewater (Wil Lutz kick), 13:28. Panthers 30–7. Drive: 9 plays, 75 yards, 5:18. CAR – Chandler Catanzaro 51-yard field goal, 8:17. Panthers 33–7. Drive: 9 plays, 42 yards, 5:11. NO – Taysom Hill 9-yard rush (Wil Lutz kick), 3:47. Panthers 33–14. Drive: 4 plays, 57 yards, 1:23. Teddy Bridgewater started in this game. With the loss, the Saints finish the season 13-3. Late in the first half of the Week 5, Monday Night game against the Washington Redskins, Quarterback Drew Brees surpassed Brett Favre (71,838) and Peyton Manning (71,940) for the most career passing yards. Brees surpassed Favre on a 2-yard touchdown pass to tight end Josh Hill, and later he surpassed Manning with a 62-yard touchdown pass to rookie wide receiver Tre'Quan Smith, giving him the NFL's All-Time Career pass yardage record. Brees also threw his 500th touchdown pass against the Baltimore Ravens, with a 1-yard touchdown pass to tight end Benjamin Watson. PHI – Nick Foles 1-yard rush (Jake Elliott kick), 4:37. Eagles 14–0. Drive: 10 plays, 75 yards, 5:14. LAR - Greg Zuerlein 57-yard field goal, 11:47. Rams 26–23. Drive: 5 plays, 15 yards, 2:12. ^ "Gayle Benson becomes Saints, Pelicans owner". ProFootballTalk - NBC Sports. March 15, 2018. Retrieved March 15, 2018. ^ "Falcons vs. Saints - Game Summary - November 22, 2018 - ESPN". ESPN.com. Retrieved 2018-12-19. ^ "NFL Passing Yards Career Leaders". Pro Football Reference. October 1, 2018. Retrieved October 1, 2018.